SRINAGAR, JAN 10 (PTK): Indian Army General Bipin Rawat said that India’s neighboring country Pakistan has always been supporting the intruders. He said that in comparison to earlier, militancy related incidents have been reduced in Jammu and Kashmir. Speaking on the condition of Kashmir, he said that the youth of the valley who want to leave the path of militancy, the Indian army is always together to help them. “We are only facilitators for peace in J&K,” he said. “We have managed the situation well along the northern and western borders,” Gen Rawat said, adding that there should be no cause for concern. Army Chief said that the decision to ban the militants lives in all areas of Jammu and Kashmir has been proved right. He said that the situation of the valley has already improved after the ban on militants, which has reduced the violence. Rawat also said in his annual press conference that there was a need to improve the situation in Jammu and Kashmir. 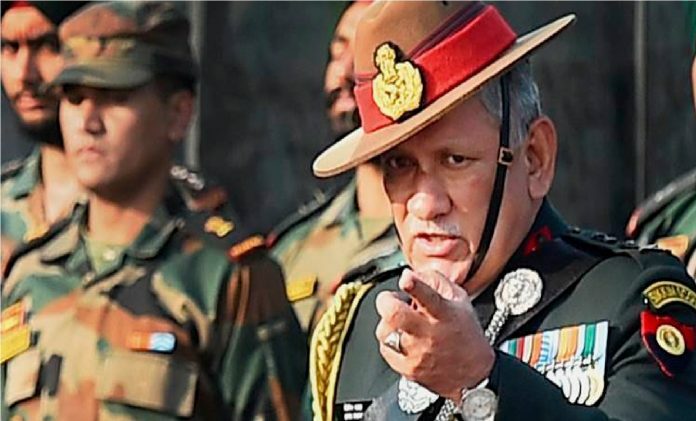 He said, “We are the only coordinators for peace in Jammu and Kashmir.” General Rawat said, “We have taken the position better on the northern and western borders. He said there should be no concern. He said that fundamentalism has taken a different form in our country. In Jammu and Kashmir the youth are becoming radical because they are being misinformed and lying about religion. This form is now becoming a war technique. The biggest issue is that the social media has to ensure that fundamentalism is not created through false and false information. It is also a cause of the spread of fundamentalism through the use of social media for the reasons that the militants organizations raise money. Army chief further added talks and terror cannot go together, and it applies to Jammu and Kashmir too.